Hartford, CT…Permatex®, a leading innovator in chemical technology for automotive maintenance and repair, received a 2018 Automotive Communications Award during the 2018 Automotive Aftermarket Products Expo (AAPEX) Show in Las Vegas, NV. Permatex earned the award for their technical feature, ‘10 Most Common Epoxy Mistakes’. The award for Best Business to Consumer-Article/Blog/Content Piece was presented during the 2018 Automotive Communications Award ceremony, by Women in Auto Care. (left to right) Donny Braga, Permatex Sr. 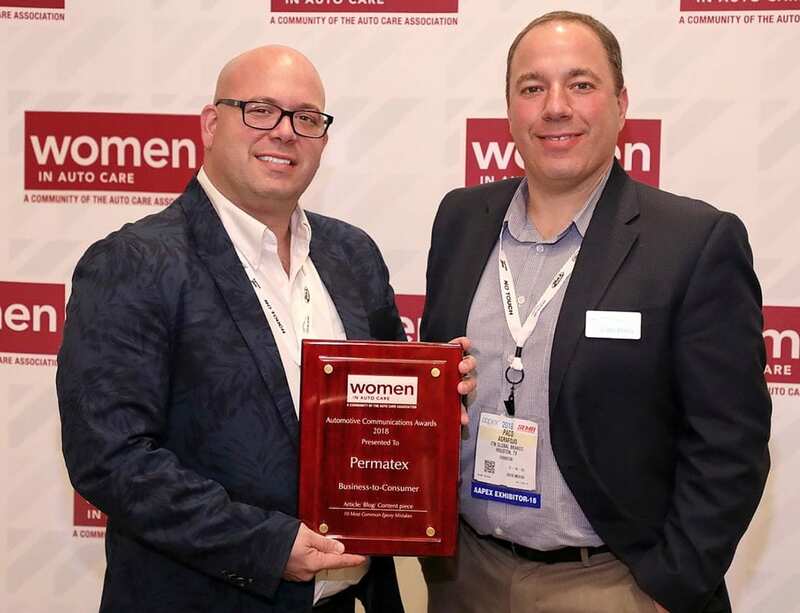 Product Manager and Paco Agrafojo, Permatex Director of Marketing, accept the 2018 Automotive Communications Award for Best Business to Consumer-Article/Blog/Content Piece.